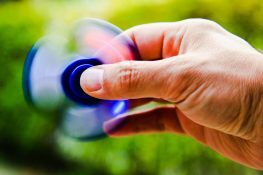 Current: Fidget Spinners: Are They Good or Not? Fidget Spinners: Are They Good or Not? By this moment, you might have heard a lot about those tiny, spinning toys that you can hold between your fingers and spin. Some people love them, others hate them. 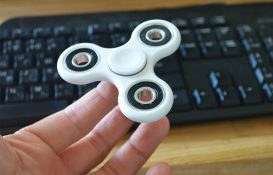 Fidget Spinners are the latest craze in 2017, and it is debatable whether it actually benefits people living with autism or ADHD or not. A lot of people claim that it’s an anti-anxiety tool that would help children with autism or ADHD to improve performance in classrooms. Fidget spinners are toys designed with a bearing in the middle and either two or three prongs that spin. That is a complicated question to answer, but the important thing is that fidget spinners got popular because of marketing, not scientific research. They were marketed on the internet as claiming to help people with ADHD, autism and developmental delays. Several medical professionals have noted that there is no evidence supporting the claims of fidget spinners’ benefits. Several parents have reported that their children with anxiety, autism or ADHD calmed down a little when playing with the toys. However, other experts, parents and teachers have concerns about the toy’s potential to be a distractor for children and students in classrooms. Some schools have gone far as banning them from the classrooms and the buildings. Several reports have suggested that several children were more focused on the toys than actually paying attention to the teachers in the classrooms. 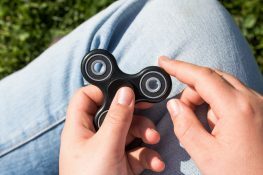 Bottom line: the Fidget Spinner is a fun toy, but shouldn’t be taken seriously as a medical aid or an educational aid.